So here it is, the much ballyhooed Brussels sprouts recipe. However, it's not exactly the original one. I decided to lighten it up a bit... in the past two days I've consumed close to two dozen spiced molasses cookies that I made. 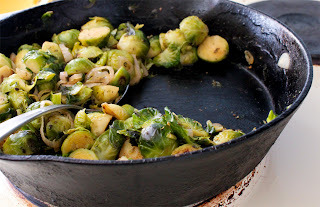 I figured I could stand to not eat heavy cream and some pine nuts, which are part of the original world's best Brussels recipe. I'll tell you what to do if you want to include those two things. Really, though, the recipe as is is awesome. It's the way I make them 95% of the time. Only if I'm bringing this dish to a party or something, do I add in cream and pine nuts. Not to mention that freaking pine nuts are like buying truffles. Kind of. Maybe like a 15th of the price, but still. Gah. Why do workout clothes absorb only the worst smells? I mean, I generally stink - being kind of a Luddite about antiperspirant - but coupled with that, I'm wearing them when I cook dinner every night. I come home from the gym and am too lazy to shower right when I get home, so I start cooking dinner while wearing them and then after dinner finally get around to showering. My gym clothes end up in a pile in the hallway to wear again the next day (really, who washes their gym clothes after one wear? Pshh, they're still good until they get positively stiff with dried sweat.) Then, when I put them on the next day after work, I realize how much they freaking smell like fat and sautéed onions. And then they get smellier as I get hot and sweaty in them, like I'm a Glade plugin or something. Everyone really loves me at my gym. The girl who smells like BO and, as was the case after cooking this recipe on a Wednesday afternoon, shallots and Brussels sprouts. 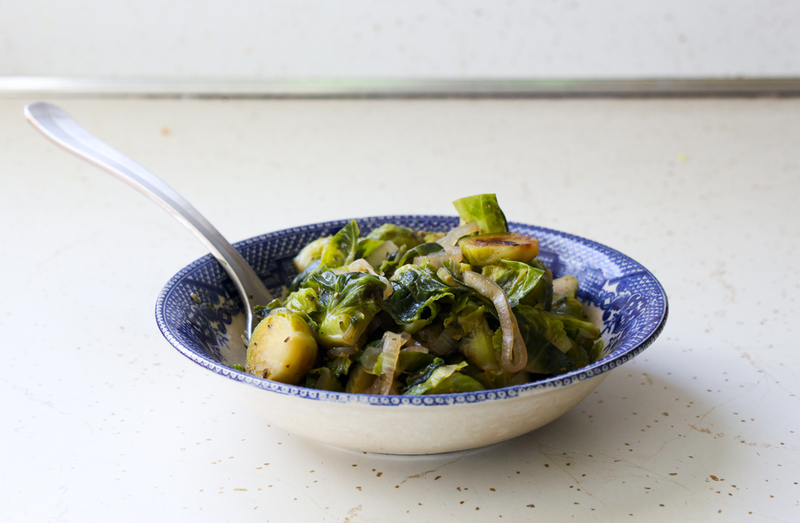 This recipe is actually stupidly easy and maybe there are way, way better recipes out there. Not sure. I made a few and then this one came along and I can't get past it. It's the secret ingredient - marjoram. I don't use marjoram for much for whatever reason, but in this recipe I dump it on. I should have a dedicated marjoram plant just for Brussels. 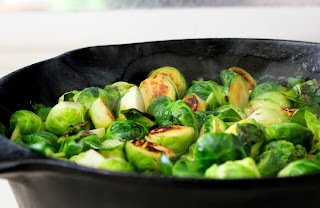 Do I have to capitalize Brussels every time I write it? The new Mac OS doesn't autocorrect it for me, so maybe it's okay? A cursory googling seems to tell me that either is okay. Do I write Swiss chard or swiss chard? You don't capitalize French fries, right? You do American cheese... I don't even know now. I've told you about my collection of fat, right? I thought I'd take a picture of my heavenly corner by the stove of animal fats and salts. Kerrygold butter (this weird "naturally softer" variety that was on super sale at Whole Foods and as far as I can tell is a legitimate product and not a "now, extra soft and 83% less fat and tastes even more like butter than butter but contains less that 2% butter! 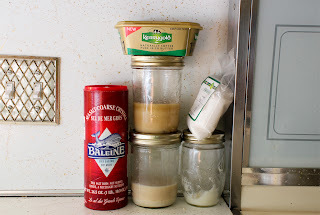 "), lard, bacon grease, and I think tallow? I like that I can't remember what animal died for one of my jars of fat on the counter. I also have three jars of fat in the fridge that have some of the juices from when I roasted whatever animal and they makes great pan sauces! The little baggie of salt is fleur de sel. I love it. optional step 1. In the skillet you'll cook your brussels in, heat 1 tablespoon butter over medium heat and add pine nuts. Stir until they're golden brown, about 3 minutes. 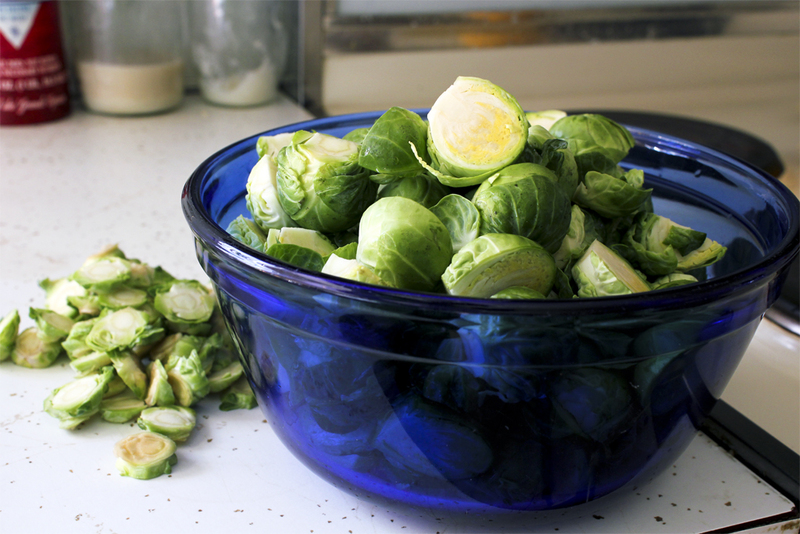 Put in a small bowl and set aside. 1. 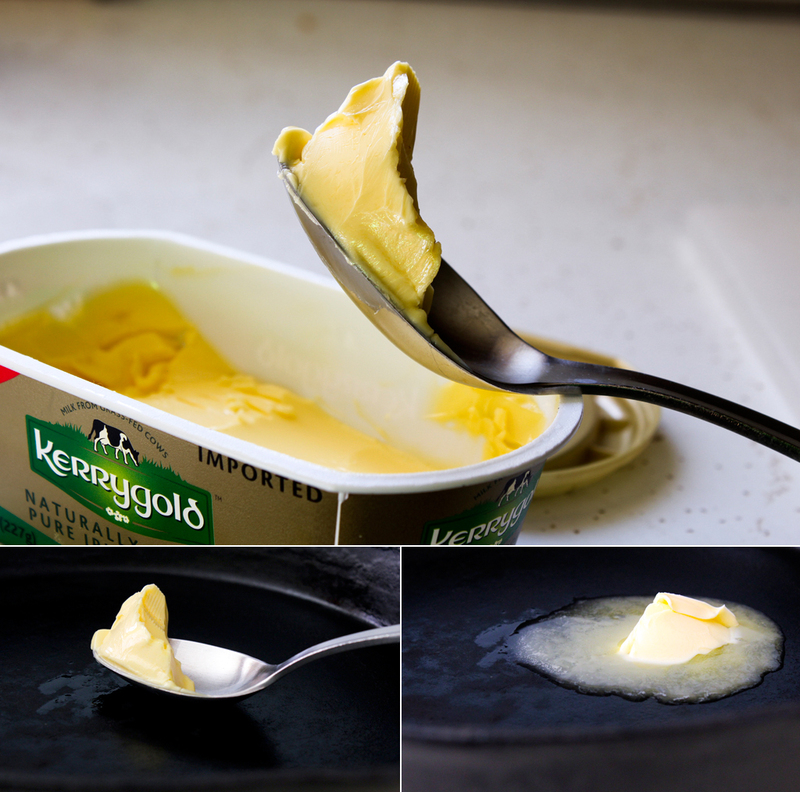 Melt 1 tablespoon butter in large skillet over medium heat. Add your brussels and sauté, stirring occasionally, for about 10 minutes until they are getting nice and brown. 2. 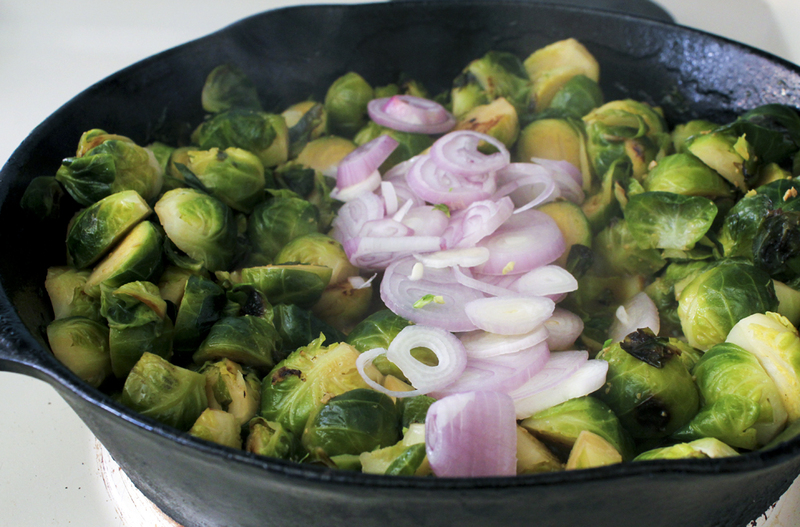 Pour in the broth, cover, and simmer until sprouts are almost tender, about 5 minutes. 3. Uncover and simmer until broth evaporates, about 5 minutes. Push aside the sprouts a bit and melt the other tablespoon of butter in the center. Add the shallots and sauté for about 3 minutes. 4. Stir in the marjoram and season with salt and pepper. If your broth is salty, then you probably won't need any additional. optional step 4. 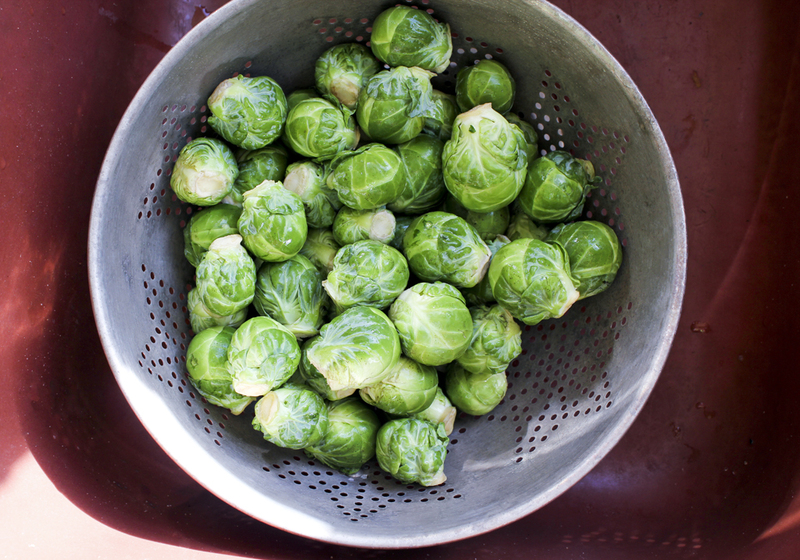 Pour in the cream along with the marjoram, stir until the brussels are coated, and simmer for about 4 minutes. Mix in half of the pine nuts, and save remaining half to sprinkle on top when they're in the serving dish. I hope you like these and aren't disappointed in them. I'd be pretty embarrassed. And I'd just workout in my corner of the gym, stinkin' it up all by myself. "Eww that girl stinks like brussels." "Yeah, and the ones she makes aren't even that good. Pff."